Sorry, this isn't stamping related... I decided to take the weekend off and actually didn't stamp at all. I am in the process of reorganizing my stamp/scrapbook room, so it was a little chaotic. Dan put together a column of cubes as a trial, and they are working out pretty well. We still need to move some furniture out, add more cubes and I should be able to see/access my supplies a lot easier. As always, it is a work in progress. 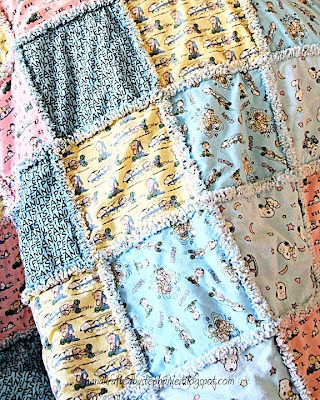 Once I got my room cleaned up again, I made a rag quilt out of leftover flannel that I had bought to make Sabrina baby blankets when I was pregnant. I made several, but I still had quite a bit of scraps, so it was nice to put them to use. I used all of the Snoopy/Peanuts flannel scraps and made a rag quilt. I got the idea on the 2Peas photography message board. Val was awesome to make a photo tutorial on her blog here. The quilt itself was pretty easy to make - I definitely recommend using a rotary cutter to cut the squares. The only part that was a little painful for me was making all the snips. The only scissors that worked for me were my big sewing shears and I ended up with a few blisters and a very sore right hand. It was so worth it, though, and I plan to make a couple more! Gotta love those flannel blankets (and quilts!). Nice additional shot of DD's new "do" too!